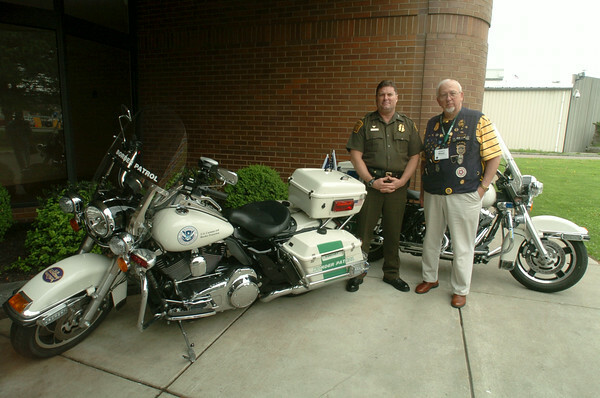 DAN CAPPELLAZZO/STAFF PHOTOGRAPHERNiagara Falls - Retired Boarder Patrol officer Richard Mauer, of Angola, and Chief Patrol agent Kevin Oaks, of the Buffalo office, stand in front of a pair of Police special Harley Davidson motorcycles during the 33rd annual convention at the Sheraton Inn Hotel. 200 Boarder Patrol officers, including 106 retired officers, and 82 guests attended the 33rd annual convention. The patrol bikes have been added to the patrol force of the Boarder Patrol.